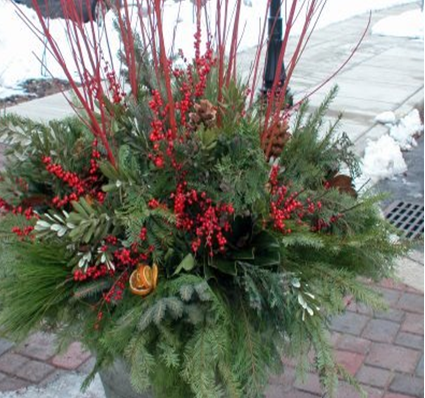 Many people use pots as a way to brighten up their front stoops, back patios, decks, doorways or any other area of their yards that could use a little color. We fill them up with annuals and enjoy them through the fall. We may even plant mums and pansies in them to extend our enjoyment. By the end of fall we most often put them in our sheds or garages to keep them safe for the winter. 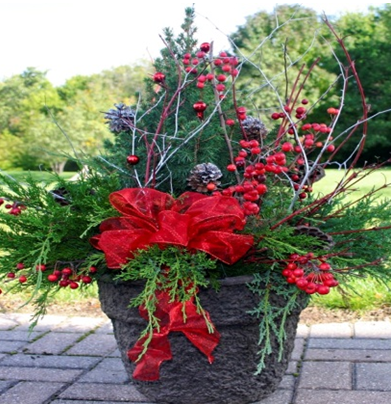 By using the pots as a part of your holiday decorating you can add color, texture, and a nice festive touch to your outside areas. Start off by taking a look around your yard. Often we can find a lot of what we need in our own back yards. Evergreen trees such as pines, spruces, junipers, arborvitaes, and holly are great for adding fullness. By mixing them up it also adds great texture and color. Branches from red-twig dogwoods will add a nice pop of red and also height to the pot. 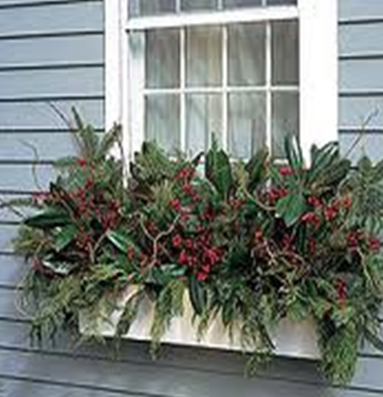 Branches that still have berries, such as winterberry and bayberry; add a colorful dimension to the pot. Pine cones lend a realistic feel. If you can’t find what you are looking for in your own yard, try your local craft store. There you will be able to find all of what you are looking for and a little more. And don’t forget the bow!